The media are all afire with sensational reports of Syrian atrocities and civilian casualties. There are calls for Western intervention to aid the opposition which are the latest protagonists in a new chapter of the “Arab Spring.” Syria is yet another opportunity to let democracy flower in the Middle Eastern desert. Granted Syria’s President Assad and his Baath party are hardly the kind of people who deserve support of the civilized world. He is at best the predictable devil we know whose human rights record is horrific and whose ties with Iran are disturbing. Under his long and brutal rule, Syria has become a supply route for Hezbollah terrorists and poses a constant threat to Israel. However, before the engines of war are unleashed against Syria, important questions need to be asked. The continuing drama in Syria is a script that has been played before. The plot is familiar. Twitter-enabled grassroots revolt against decades-old Middle East dictatorships. Frustrated masses armed with cell phones occupy squares and towns. Ruthless armed forces and paramilitary thugs counterattack killing innocent civilians. Western arms and sanctions come to the aid of a ragtag opposition while Western money fills its coffers. Media hype reaches a climax. The dictator is overthrown. There is general rejoicing in the streets. And then… the media lose interest and abandon the country for the next one. It is as if a media blackout descends upon the newly liberated country far more efficient than that of any dictator. Before the final act of this tragedy plays out in Syria it would be good to ask what will happen after the curtain falls. What is in store for Syria when its “spring” ends and winter sets in? The second act of this script, which the media do not broadcast, is disturbing. It runs more or less like this: The dictator is overthrown. The opposition splits into factions and divide up the spoils. Arms depots are despoiled and dangerous weapon systems go missing. Tribal groups assert their authority and fight with other tribal groups. Revenge killings and violence breaks out. Christians are persecuted and even martyred while their churches are burned. Organized Islamists and al-Qaeda groups maneuver and take key positions in government and agitate for radical Islamist regimes hostile to the West. Western advocates of this script deceive themselves into thinking this whole process is but an exercise, although a very messy one, in building budding democracies. They do not want to admit the fact that hostile and radical groups take advantage of the chaos generated by these uprisings to promote their agenda, cause instability and undermine any democratic action. A sane foreign policy toward Syria should rewrite the “Arab Spring” script. The West cannot continue to lend its support to ragtag groupings that ultimately end up putting radical Islamists in power. 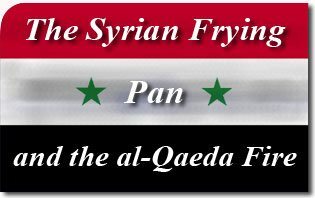 It does no good to take people out of the Syrian frying pan and throw them into an al-Qaeda fire. This entry was posted in News Commentary and tagged arab, Arab world, Assad, Baath, democracy, flower, Media, middle eastern desert, party, people, President, Syria, twitter, world by John Horvat II. Bookmark the permalink.